Cinnamon, orange, spice, and mandarin peel create a Christmas-scened, palm oil free bar soap. Handcrafted in Central Victoria, Australia. Free from SLS, SLES, parabens, fluoride, titanium dioxide, glycols, fragrance and mineral oils. 100g. POI can confirm that all products made by Urthy Organics are 100% palm oil free. 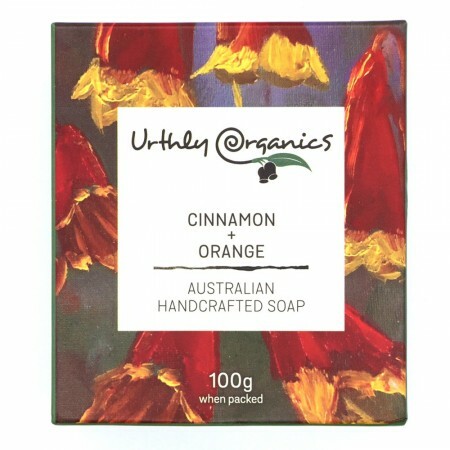 By purchasing products from Urthly Organics you will be supporting a small Australian business that are producing quality products that are 100% ethical and palm oil free. Acquiring ingredients straight from the grower where possible. Produced in a sustainable environment. Made in Central Victoria, Australia. Saponified *olive oil, coconut oil, *hempseed oil, *macadamia oil, with *shea butter, *cocoa butter, natural colourings and/or essential oils. Includes cinnamon, orange, spices, and mandarin peel. *Organic ingredient. 100g. Each handcrafted product may differ slightly in appearance from the photos. Browse our other natural soaps. Lovely product, smells and feels great. Good for a gift, but too expensive for me to use everyday.